China’s execution of Naw Kham, a drug lord convicted of masterminding the execution-like killing of 13 Chinese seamen on the Mekong River in October 2011, has whipped up a storm of controversy for its lead-up being carried live on state TV. Laos had extradited Naw Kham, a Burmese, and three of his gang, one Thai, one Lao and one stateless, to China in May 2012. They were convicted and sentenced to death by a Kunming court last November. CCTV, in a live two hour broadcast, showed the men being taken from their cells and subsequently prepared for execution by lethal injection. It did not air footage from inside the death chamber. Condemned criminals were once commonly paraded before their execution but the practice is now rare, and certainly on live TV. Yu Guoming, a professor at Renmin University’s School of Mass Media, was quoted as saying the broadcast was a response to widespread outrage in China over the brutality of the killings, as well as an attempt to emphasize the heinousness of the crime and the efficiency of China’s police and courts in doling out justice. Civil rights activists have criticized the broadcast as an affront to human dignity. The broadcast was also likely an attempt by authorities to reassure Chinese that their government is paying attention to the safety of its nationals abroad as China’s increasing global reach puts more of its citizens in harm’s way around the world. Xi Jinping, China’s president assumptive, has appeared in public for the first time in a fortnight. State media report that he visited the China Agricultural University in Beijing on Saturday to take part in National Science Popularisation Day. There is a photograph (above) to prove it. The word is that Xi hurt his back while swimming, and his doctors told him to lie low while undergoing bed rest and physiotherapy. He clearly took them at their word–while social media went into a speculative frenzy further whipped up by state media staying silent old school. Xi always looks a little stiff in public, and carries himself erectly, so it would be difficult to tell if he was suffering any discomfort on his Saturday morning visit. He looks to be carrying his left arm awkwardly, especially in this photograph, but, we are told, he did wave his arms round a couple of times during his inspection walk. The zipped-up jacket, in contrast to the open ones of most of his entourage, prevents any assessment of whether Xi was wearing a back brace. There doesn’t appear to be any loss of weight or drained looks that might be associated with a serious illness, so injury will suffice as a plausible explanation for Xi’s disappearing act, until, if ever, the state secret of what ailed him is revealed. If the Party Congress, at which Xi will formally start his ascent into the top jobs, goes ahead as expected, we can assume that he is fully recovered. The man expected to become one of the two most important leaders on the planet has dropped from sight for more than a week–and the world is none the wiser why. Vice President and president assumptive Xi Jinping hasn’t been heard of since the beginning of this month. He has cried off meetings with various visiting politicians including U.S. Secretary of State Hilary Clinton. Nor did he appear in a TV broadcast on Wednesday that included most of his fellow members of the Politburo. The rumour mill has gone into overtime: Xi is sick, injured, suffered a stroke, fallen victim to a political coup, wounded by an assassination attempt, eloped with Kim Jong Il’s new wife. We invented the last, but there is no more hard evidence for any of the alternative explanations. State media have been unforthcoming to an extent that is tight lipped even by their standards. This is another reminder of how little the world knows about the inner workings of China’s political elites. But China now occupies a place of importance on the world stage. The time has passed when the health of top leaders needs to be guarded like a state secret, to be kept from both a country’s own people and the rest of the world. There are three aspects to a leadership transition, a well-connected Chinese economist told this Bystander: the personal and factional jockeying for power; the ideological/directional debates; and the exceptional cases. The downfall of Bo Xilai, now stripped of all his Party posts, falls into the third category, she reckons, though it clearly cuts across the first two. The new left–the neo-Comms and Maoist revivalists, among whose number Bo was counted–have been put on the back foot by Bo’s ousting. The relatively small number of places in the new Politburo and its all-important standing committee, the inner sanctum of Party power, have likely been already broadly decided, but the reformers should now be able to put more of their supporters into key positions in the bureaucracy and provincial government. The neo-Comms and Maoist revivalists have not necessarily lost the ideological debate, or at least not definitely. Bo was both a populist and popular. Support for his ideas persists both among the public and within the Party, if not sufficient to save his political career. There is likely to be a show of consensus, however. Top Party leaders will seek to keep a tight grip on the judicial investigation into Bo, his wife Gu Kailai and the former head of the Chongqing police, Wang Lijun, whose visit to the U.S. consulate triggered this incident, and where, it now emerges, the first accusation was made that British businessman and Bo family associate, Neil Heyward, had been murdered, with Gu and a family employee involved. What needs watching is how the official narrative of Bo and his wife is played out. State media are starting to lay down the exceptional-case story, and emphasizing that no Party member, their spouse or family is above the law, even if that family is a princeling–or, more particularly to our eye, that even a princeling family isn’t above the law if it embarrasses the Party or puts political stability at risk . How Sino-Centric Is The World Wide Web? As Mark Zuckerberg, the founder of Facebook, wanders around Shanghai, he will no doubt reflect, and not for the first time, on the fact that China accounts for barely 500,000 of his highly successful social network’s 400-plus million users around the world. He might also like to consider this: by 2016 China will have more internet users, at nearly 800 million, than the U.S., the U.K., France, Germany, India and Japan — combined. That forecast comes from The Connected World, a Boston Consulting Group report published at the time of the annual Davos shindig in January. If more than a quarter of the 3 billion people in the world the report reckons will be online by 2016 are in China, compared to a tenth in the U.S., should we be thinking of China as being at the center of the Internet and the global digital economy rather than the U.S.? It may be misguided to think of anything as distributed as the Internet as having a center. Yet sheer weight of population is fast swelling the China node, and challenging the notion that China, by its own volition, can be a web world of its own. The first e-mail sent from China contained the message, “Across the Great Wall, we can reach every corner of the world” — even if the opposite hasn’t proved particularly to be the case. Yet more and more of that world is increasingly inside the Great Wall. With a population of 1.3 billion and an internet penetration rate of 38.3% at the end of last year, there is plenty of scope for grow the ranks of netizens. In raw number of internet users, China passed the U.S. in 2008, though fewer than one in four Chinese was online then compared to almost three out of four Americans. Between 2007 and 2010 China added more Internet users than exist in the U.S. It now has 513 million netizens. The U.S. has 245 million. If China now had America’s current online penetration level (78.3%), it would already have more than 1 billion internet users. China, like other emerging economies, is also riding a second underlying trend, a world going digitally mobile. It doesn’t have to put a PC on every desk to get its citizens online, just put a smartphone in their hand. Two-third’s of China’s online population accesses the Internet via mobile phone. This year, for the first time, more smartphones will be bought in China than in any other country. China can leapfrog the desktop just as some emerging economies skipped the landline in telephony. It can also go straight to the social Web. Tencent’s QQ messaging service is what set the company on the road to becoming China’s largest Internet company by market capitalization. Its Weibo (microblogging) service is easing ahead of rival Sina’s (they have more than 500 million users between them). Its Weixin mobile app took barely 400 days to acquire 100 million users. Social networking is a substitute for having no siblings to talk to at home, we are told. Well perhaps. More likely, weak IP protection and weak competition from TV has driven heavy use of the Internet in China for entertainment, particularly online music and videos, and the conversations that follow that. Tencent has adeptly cashed in on that with online games and entertainment. Consumers expect to pay for mobile phone services. They have grown used to them being free on a PC, to the detriment of any business in a country that was an early adopter of desktop computing. China has also walled off its domestic market to censor and protect domestic industries. There are only two major economies where Facebook isn’t the leader in social networking and Google in search. One is Russia. The other is China, where Renren leads in social, and Baidu in search. Google’s problems in China are too well documented to need rehearsing here, but it is worth noting that Zuckerberg’s 500,000 Facebook users in China constitute a 0.0004% local market share. It has 50% in the U.S.
China’s Internet companies have been in the happy position of being fast followers of the leading global companies, able to learn from them without facing undue competition from them and all the while riding a fast growing economy playing catch-up in Internet use. It seems inevitable that there will be foreign pressure to open up China’s Internet market, just as there has been to open up other sectors of the economy. Domestic Internet companies are starting to position themselves for that eventuality. The recently announced proposed merger of the online video sites Youku and Tudou is sector consolidation to that end. Each country will fashion the Internet in its own image to a certain extent. Whether the Internet more globally is Anglo- or Sino-centric is determined not only by users but also by usage and content. More than half the content on the Internet is still in English. That is despite the fact that the share of all Internet users who count English as their first language is shrinking (the blue line in the chart to the left). In 2000, it was almost two in five. As of March last year, the latest available figures, it is, at 27%, barely one in four. Over the same period the share of native Chinese speakers (the green line in the chart) has risen to 24%, or almost one in four, from 9% or one in eleven. 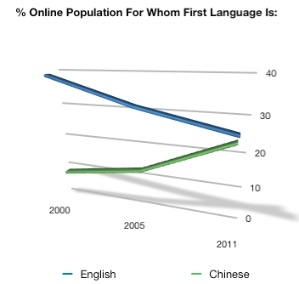 Native Chinese language speakers are the second largest group online after English speakers. (Japanese, Spanish and German round out the top five languages online, accounting for a dominating 68%). Where Chinese’s sway falters is that English is the dominant second language and language of business. Even if the official push to promote China’s culture increases the volume of Chinese language cultural and entertainment material online, the international audience for it will be relatively limited. A tonal language like Chinese is ill-suited to the battering it gets when spoken by non-native speakers. English has proved far more robust. It has even spawned a variant, Globish, for just that purpose. A shift in geographic center towards the emerging economies is not the only change shaping the Internet. Bits and bytes now follow the Brics, as trade once followed the flag, perhaps. Reflecting the shift from nation states to a global economy bestrode by mulitnationals, it is also forming around digital ecosystems that have companies at their center, such as Google, Facebook and Apple in the U.S., Tencent and Baidu in China and Yandex in Russia. They are shaping an Internet economy that cuts across old national boundaries. BCG forecasts the Internet economy will be worth $4.2 trillion in the 20 richest nations by 2016. By that time, IBM has forecast, 1 trillion devices, from phones to fridges and control systems will be connected to it. BCG says the Internet economy will account for 8% of G-20 nations’ GDP, up from 4.1% in 2010. That would be like adding another Italy or Brazil to the G-20 (we are a sucker for such analogies; and, yes, we know GDP figures are probably not adept at capturing Internet economic activity). Yet China’s Internet giants have a long way to become the corporate hubs of global digital ecosystems. The commercial growth to come domestically may act as a deterrent to them becoming so. In 2010, the search engine market was worth $1.75 billion and is forecast to reach $14.5 billion by 2015. But over the same period, e-commerce is forecast to expand from $75 billion to $315 billion, at which point it would pass the value of e-commerce in the U.S., estimated to grow from $180 billon to $304 billion in 2010-2015. China’s sheer size makes national bricks and mortar retailing difficult. E-commerce is further boosted by cheap shipping and high rates of urban broadband penetration, already on a par with America’s at 68%. However, as BCG says, broadband infrastructure alone isn’t enough to push a country to the forefront of the Internet economy. Also needed are “a favorable regulatory environment, strong payment systems, consumer protection for e-commerce transactions, and a willingness on the part of governments, business and consumers to go online”. Forecasts about the Internet in China should always carry a large caveat not only about the commercial environment, but also about the political uncertainties surrounding them. China censors its social networks internally and the wider web externally with its Golden Shield, more familiarly known as Great Firewall. Leaders brought up in the era of state-run broadcasters and newspapers have very different hopes, fears and aspirations for the Internet than the generation that is growing up with it. China’s digital natives have just as much scope to use it to change society and commerce as their equivalents elsewhere. The question is the degree to which they will be constrained from doing so. What is certain is that the rising tides of the global web, like those of the global economy, are shifting in their direction.